2016 was somewhat of a mixed bag for the major online video platforms (OVPs). Some of them struggled to adapt to a changing market as newer OVPs and revamped rivals redoubled their efforts to gain traction in the market. But the positive news for all parties was that the video market itself looks to be growing significantly: video now accounts for 64 percent of all internet traffic, and predictions suggest that figure will reach 80 percent by 2019. Given this environment, it was perhaps surprising that unlike the other two main platforms, Brightcove and Kaltura, Ooyala did not rate highly in Forrester Research’s latest study (“The Forrester Wave: Online Video Platforms for Sales and Marketing,” Q4 2016), which reviewed platforms on their ability to support sales and marketing in the enterprise space. The study looked at nine of the most significant OVP providers—Adobe, Brightcove, IBM, Invodo, Kaltura, Ooyala, Qumu, uStudio, and Vidyard. The three main factors that were considered in determining each platform’s rating were marketing, analytics, and syndication. The study also evaluated each platform on how easy it is to use and how easy it was to integrate with other systems. The reasons for Ooyala’s absence from the top three are linked to Telstra’s purchase of the company in 2013. Telstra paid $331 million for a 98 percent stake in Ooyala, which then purchased two more companies—Videoplaza in October 2014 and Nativ in mid-2015. Videoplaza was intended to help with video monetization and Nativ’s technology with the automation of content creation workflows. In August 2016, Telstra wrote down the value of Ooyala by $246 million. The write-down was “reflecting changing dynamics in the intelligent video market and business performance,” Telstra CEO Andrew Penn told journalists when it was announced. “The business is growing, and it has a successful future ahead of it. But the intelligent video market has changed,” Penn said. Overall, the write-down suggests there has been a significant reduction in the revenue Ooyala expects to generate, but it should not have an impact on the functionality of the platform as considered by Forrester’s study in the short term. However, the write-down reinforces the perception that Ooyala has not only lost staff but also its startup style culture by becoming part of Telstra. The loss of former CTO Sean Knapp in April exemplifies this. He was seen as a reassuring presence on the board for clients, but along with developing and maintaining the platform in general, he and the development team were also working on solving the problems of video recommendation based on user profiling. Solving this problem is potentially an important part of the platform. Relevant content is known to deliver longer viewing times and therefore more engagement. This in turn equates to more ad revenue per viewer. Ooyala has taken the view that its clients want to do more themselves; the company hung on to Flash player technology longer than its competitors did. Along with losing this potential competitive advantage, the other key problem Ooyala needs to deal with is its player technology. Other major platforms quickly embraced HTML5 players in their products and went through the growing pains of delivering these to clients. Ooyala was slow to do so, hanging on to Flash delivery for longer than was advisable. Ooyala only launched an HTML5 player in April 2016, unlike rivals Brightcove and Kaltura, which have had one since 2012 and 2010, respectively. While Ooyala has taken the view that clients want to do more themselves, both Brightcove and Kaltura have slightly different views of the market. They take the view that due to the complexity of implementing and, more importantly, maintaining a platform, corporates will continue to invest in third-party platforms to solve the problems of upkeep, support, and self-maintenance. Obviously their respective business models are predicated on this assumption, but at the moment there is no evidence that corporates are developing platforms in-house en masse. Still, Kaltura is planning for more clients to develop in-house platforms in the future. 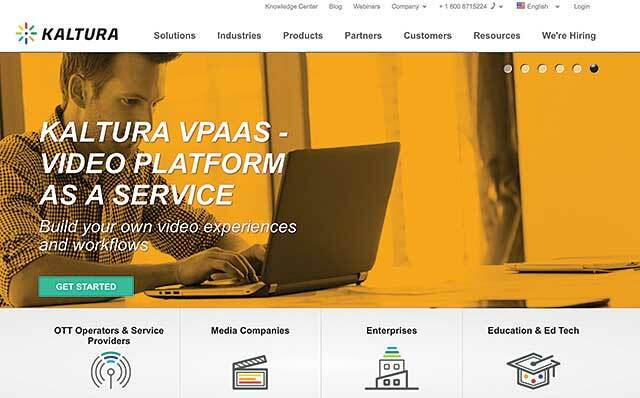 In May, Kaltura launched Video Platform as a Service (VPaaS). This service is designed to offer developers and in-house teams the capability to develop bespoke applications and services while the video workflows and player delivery is handled by the Kaltura platform. Kaltura introduced its Video Platform as a Service in May 2016. The service offers developers and in-house teams the ability to develop bespoke applications and services while Kaltura handles the video workflows and player delivery. Kaltura still has more work to do in the space according to the Forrester report. Its robust and heavily customizable software development kit (SDK) and usability were both praised, but the report noted work still needed to be done on its CRM (Customer Relationship Management) and MAP (Marketing Automation Platform) integration. Brightcove came in at the top of the Forrester report, but again there is work to be done to improve interactivity and boost the deployment of its HTML5 player. Brightcove did, however, make significant steps forward in its journey toward profitability with the Q3 results showing earnings per share at 3 cents with similar guidance given for Q4. In Q3, revenue was around $1 million above estimates (38.39 million versus 37.32 million). The continuing investment in the business appears to be driving faster growth than expected. Brightcove looks likely to turn its first profit this year. The functions of UC platforms are expanding and occasionally overlapping with the role of corporate video. What's the smart way to bring them together? Corporates are embracing social video, while still investing heavily in traditional enterprise video platforms.